As per original plan we were to leave Chandigarh by 10 AM, we were informed that the drive has been preponed because of the possibility of bad weather at destination. We had planned on leaving Delhi for Chandigarh around 5 AM hoping we would reach before 10 AM. But now we had to prepone it. So we decided to leave Delhi just after dinner. 2:15 AM Checked out from the hotel and started the drive towards Chandigarh. 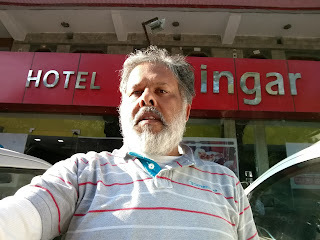 6:00 AM Reached one of the hotels in Chandigarh where AIM fellow drivers were staying. 7:30 AM Started from the hotel towards Mandi. 8:15 AM Reached at the Heritage Haveli restaurant. Stopped for breakfast. 9:30 AM Started after breakfast. 12:30 PM Stopped for a tea. 2:20 PM Reached Mandi, met up with the rest of the AIM team. Had lunch at Shingar hotel. 3:45 PMStarted as part of a convoy towards the final destination for the day. Here is the timelapse of complete drive as part of the convoy. Lsat 10 kilometers to Sojha, there was a concern regarding snow on the road. We stopped below the final climb for almost an hour before continuing further. This final streth was tough on cars partly because of very bad quality of road and partly because of occasional snow on the road. 8:00 PM We were in the PWD guest house in Sojha where everybody had gathered for the dinner. Once we had dinner, we got into our hotel room and called it a day.